PHILADELPHIA — A text message I received from Iowa this morning is similar to dozens of others: “Is it really as bad as it looks on TV?” The answer depends on where you look. With a few notable exceptions, most television cameras are focused on prime time convention coverage, which happens each evening at the Wells Fargo Center. But convention activities occur throughout the day. Each morning state delegations hold breakfast meetings, usually in or near their designated hotel. These are open to the press and are typically favorites of state-based political reporters because they provide ample opportunity and easy access to state party leaders and members of the delegation. About four miles from the arena, just on the edge of Chinatown, delegates meet as a part of constituency caucuses at the Philadelphia Convention Center. The schedule on Tuesday, for instance, included meetings of the LGBT, rural and women’s caucuses. Regardless of how delegates identify themselves — African American, Asian, people with disabilities, members of the labor movement, small business owners, military veterans, etc. — there is probably a meeting scheduled. Advocacy groups are also present at the convention center, and many have organized panel discussions of issues central to their cause. None of these additional activities are mandatory for the delegates. In fact, nothing is really mandatory. What state delegates gain from the convention, and what their experience is, largely depends on how active and engaged they choose to be. Another factor is why a chosen delegate wanted to come to this convention. Those who came to Philly with the singular purpose of making a case for their chosen candidate aren’t necessarily interested in organizing through a constituency. They are busy seeking out opportunities to draw media attention. As a result, the group meetings and panel discussions I’ve attended have been blissfully free of candidate-centric consternation. On Wednesday morning, some wore “Thank you Bernie” shirts adorned with Clinton-Kaine campaign buttons. 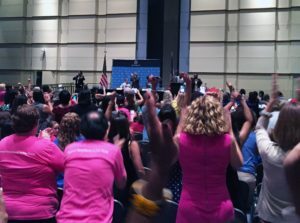 This isn’t to say everything is rosy — especially after many Sanders delegates stormed off the convention floor Tuesday night, chanting as they marched through a media area. Not all of them returned. A third of Iowa’s Sanders delegates didn’t come back. 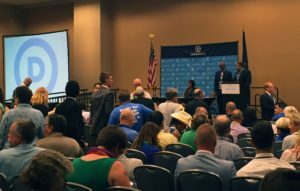 Fissures remained apparent at the Iowa breakfast Wednesday morning as some Sanders delegates expressed dismay that a Sanders delegate was not included in the state’s roll call vote response. Following one emotional plea, a few Sanders delegates left the breakfast meeting too. At the LGBT caucus meeting, I asked why divisions hadn’t filtered into the constituency groups. “It’s hard to worry about who is supporting who when you are focused on making sure your brother’s civil rights are maintained,” an Oklahoma delegate told me.